Cut off the woody stem on each Brussels sprout and remove any tough or bruised outer leaves. Slice Brussels sprouts very thinly to make a mound of feathery ribbons. Heat olive oil in a large skillet over medium-high heat. 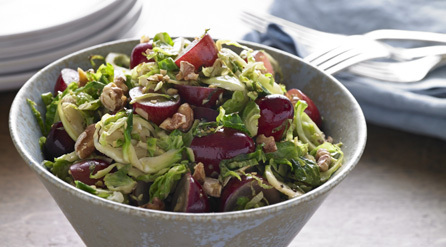 Add Brussels sprouts, grapes, salt and pepper to skillet and sauté 3-4 minutes. Reduce heat to medium and add garlic, ginger, Dijon mustard, honey and balsamic vinegar to pan. Continue to sauté for approximately 1-2 minutes, until sprouts are tender and bright green in color. Turn off the heat and add walnuts to pan. Gently mix to combine.